You know how it is sometimes. You prepare a new recipe, you like it so much, you have to make it again the next day. That’s what happened to me with cauliflower. I loved the gobi I prepared last weekend very much, I made it again today. This time, I also added few potatoes to the pot. The friendship between brain-like cauliflower and belly-like, comforting potatoes is legendary. The fragrant kasuri methi and the sweet golden raisins addition made this lovely friendship even more endearing to me. I can surely say that this is the best cauliflower curry I have ever made next to my amma’s recipe. Good use of cauliflower that’s in season. The preparation is easy. Heat oil in a sturdy pot over medium heat. Add and toast garlic to pale brown, and then cumin and mustard seeds. When seeds start to pop, add onions. Saute to soft. Next goes the tomatoes. Cook them to soft on high heat, and mush them using a sturdy spoon or spatula. Add potatoes, and cook to just tender. Add cauliflower. Also the items listed in seasoning, along with half cup of water. Mix. Cover the pot and simmer. When cauliflower reaches the tenderness you desire, turn off the heat. Serve the curry hot with rice or with roti. Kasuri methi adds wonderful aroma, whereas golden raisins soaked up in spices add khatta-metha taste to aloo-gobi. Delightful! With puri, chapati or with rice. Feel free to size up the recipe, for a sweet tasting and serenely scented Gobi Kasuri methi. It has been so dreary cold here lately. Soup like dal-rice combo has been my main meal most of the days. Worn-out of my routine tomato dal, I thought of dazzling it a bit. That started a craving for crispy, crunchy chickpeas. A cup of rehydrated chickpeas, 20 minutes in front of hot oil. Now, I remember why I don’t make these often. :) Next time I will simply buy or bake. Soak dried chickpeas in water to plump. Drain and then pat them dry using a kitchen towel. Deep-fry in batches, in hot peanut oil to crisp. Prepare spice mixture: Heat a teaspoon of ghee. Add and toast curry leaves, chilli powder, amchur and salt to taste. Toss and coat the chickpeas in spice mixture. The fried chickpeas are great to jazz up the dal and sambar rice. Also to munch on, and to add to salads. The television ad voice for Lindt chocolate asks us. The pecan-persimmon cake turned out to be a vision in real life as well. A delectable, one of a kind dessert that taste buds never forget. Take the flour in a vessel. Add the persimmon, pecans, maple syrup and ghee. Sprinkle baking powder and cardamom. Stir in about half to one cup of warm water. Combine thoroughly. Divide the batter between the cake pans and spread evenly. Pre heat the oven to 350 F. Place and bake the cakes to warm sunset hue, for about 20 to 30 minutes, until a knife inserted in the center comes out clean. Let cool and invert to serve. For this recipe, I used Maple Grove Farms brand buttermilk-honey pancake mix, which has both wheat and barley flours in it. The flour-mix worked beautifully and offered a great remedy to my egg-fruit combo cake phobia. I purchased this pancake mix from Fred Meyer’s grocery. This is a egg-free cake, but it came out crumbly and flaky due to buttermilk in pancake mix. The acidity of buttermilk, warm water and maple syrup combo created cake crumbs full of flavor. Cool, New Tool from Google, Finally! Congratulations to Google team for coming up with an intuitive transliteration tool for Indic languages (Telugu, Tamil, Malayalam, Hindi and Kannada). The majestic Saffron is one spice that rightfully deserves our respect. The number of hours spent plucking the saffron flowers and then the stigmas is just mind blowing. 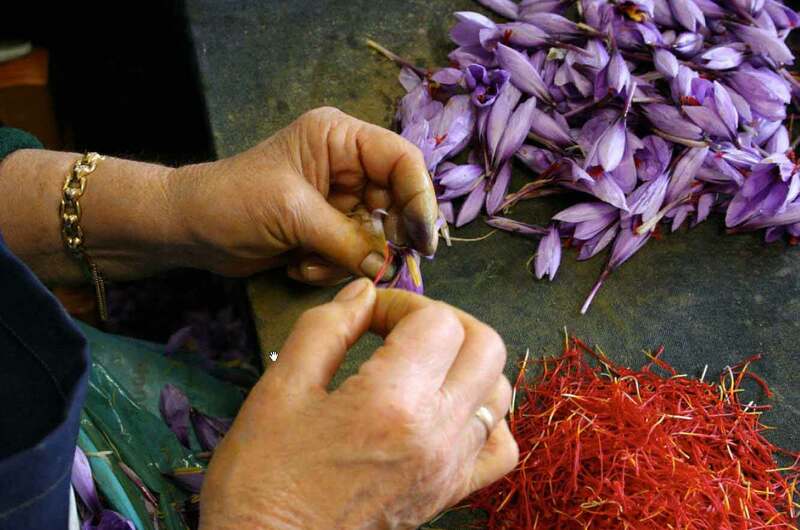 Something like 50,000 flowers, a football field-sized patch, must be grown to produce just one pound of saffron. Saffron is the stigma of crocus flower, so the botanical name Crocus sativus. Harvest season lasts for 2 weeks and the flowers are picked each morning. The 3 stigmas in each blossom are hand-picked. After plucking, the stigmas are light roasted which dries the stigmas and fixes the flavor in the threads. This delicate stage of roasting is done only by the most expert of farmers. Even as little as a minute too long on the fire and the whole batch would be ruined. The saffron crocus is sterile and the crop is propagated by corm multiplication. Each corm lasts only for one season and then is replaced by up to 10 cormlets. The size of the corm has a very significant effect on the production of daughter corms, and on the production of flowers and the yield of saffron. Saffron flower is amazingly beautiful and fragrant. It has pale lilac petals with dark colored veins. Saffron crop can tolerate frosts and an occasional snow. It grows in a wide range of soils but thrives in clay-calcareous soil. Saffron is used in Ayurveda as a good heart tonic for all three doshas, and is also an important ingredient in many Ayurvedic medicines. For example, “Shatavari Plus” has saffron as one of its main ingredients. Saffron has circulatory stimulant properties, is warming and very rejuvenating. Saffron milk is an excellent remedy for Anemia. It is also known to tonify the female reproductive system. The cosmetics industry uses saffron in lotions and creams for its ability to nourish and lighten the skin. And, of course, we all are familiar with the bright golden yellow Saffron robes of Buddhist monks. The color of their robes speaks volumes of their renunciation. When a young green leaf turns yellow or orange, it falls off from the tree. The Buddhist monks wear yellow saffron robes to constantly remind them to let go and not cling to the earthly pleasures. Since Saffron and Kashmir are inseparable and I am such a big tea fan, we have to have a cup of Kahva (Kashmiri chai with saffron). This tea is amazingly aromatic and an experience in itself. Here is a very good post on Kahva. Note that this Kahva is different from Kava, a herbal drink from south Pacific. A classic and simple dessert with Saffron is Shrikhand. Tie yogurt in a clean muslin cloth. Keep in a sieve and place a heavy pan over it. Keep overnight to drain all water. Once all water is drained from the yogurt, add sugar and mix really well. Sugar must be dissolved completely. Add crushed cardamom, saffron. Serve with charoli on top. Some of you might remember that I mentioned once about growing mustard seeds and enjoying the beauty of Punjab in my own backyard. Now, how about a little Kashmir in your back yard. We can grow our own Saffron!. Looks like some avid gardeners are even growing Saffron in containers. There are a lot of online vendors and nurseries where you can buy the saffron corms. Growing Saffron is time consuming and needs a lot of patience. But I think I am up for this project too. Now letâ€™s seeâ€¦ I have mustard from Punjab, Saffron from Kashmirâ€¦ Hmm … whatâ€™s next? They see each other everyday. Unassuming and simple, darling daughter of lentil family - the golden Toor Dal. The upright, some even call almighty - the proud and pristine Rice. A hill of rice on a banana leaf, and a ladle full of dal next to it. Served and seated next to each other, the attraction between them was instantaneous and electric. It hasn’t escaped the wise hostess notice. The marriage was inevitable. Nourishing vegetables and sensual spices were added for a seductive liveliness. Under the sacred fire, they seized to be toor dal and rice, instead became Bisi Bele Huli Anna. “A match made in heaven, for good times and for hard times”, people praised the joyful union. Bisi bele huli anna. Yes, all would be all right! That was the “once upon a time” story for Bisi Bele Huli Anna, the famous south-Indian comfort food. Originated in Karnataka region of India, the rustic and rural Bisi bele huli anna with its uncomplicated, unfettered and fundamental recipe has many fans. From children to very elderly, many Bharatiya find delight in this humble food. This week’s cold snap made Bisi bele hule anna a prudent choice for us. And, I remembered I had a jarful of Rosematta rice. The plump, terracotta colored rice from Kerala region absorbs flavors very well and I know that toor dal will be swooning in Rosematta company. My preparation started with fresh Bisi bele ground masala and cutting up the vegetables. We can add any number of vegetables and I went with gawar beans, red bell pepper, red onions, peas and carrots. The Bisi bele huli anna turned out to be a delightful meal. Long live Bisi Bele Huli Anna! Take rice and toor dal in a wide pot. Add about 6 cups of water. Cook the dal and rice to very tender. Gently mix and mush them. I resorted to pressure-cooking, but back at home, they cook it for an hour or so on slow heat. Results in superb taste. While the rice and dal are cooking, in another big vessel, heat a tablespoon ghee or oil. Add and toast the tadka ingredients (curry leaves, cumin, mustard seeds and hing). To the tadka, add the cut vegetables and saute. When they start to get tender, add the tamarind pulp, jaggery, turmeric and salt. Also the cooked and mashed rosematta rice-toor dal mixture. Stir in the masala along with two cups of water. Combine well. Have a taste and adjust the spices to your liking. Cover the pot and simmer for about ten to fifteen minutes on medium-low heat. Serve hot with a teaspoon of ghee drizzled and with papads. Rosematta idea from My Chow Chow Bhath. Brown rice or brown basmati also works well for this recipe. 5 dried red chillies, 1 tablespoon each- chana dal & coriander seeds, 1 teaspoon cumin, ¼ teaspoon each -cloves, cinnamon, methi seeds and black peppercorn. Dry roast. Cool. Then take them in a Sumeet Mixer or blender. Add 2 tablespoons of freshly grated coconut and pinch of salt. Grind to fine consistency. Asato Ma Sadgamaya; Tamaso Ma Jyotirgamaya! Shubha Deepavali to Family and Friends! I love fruit-flavored yogurts. I often make them at home with whatever fruit I have at hand. I cut and crush the fruit and mix with homemade yogurt. Depending on the fruit sweetness level, I usually add sugar or honey and salt to the yogurt. Takes only few minutes to prepare and offers a very cool way to end the meal. Also, no matter what time of day it is, a small cup of fruit-yogurt always has the power to cheer me up. Rinse, and make a shallow, vertical cut on the pomegranate. Separate the halves. Pull the fruit open and shell the seeds over a bowl. Add yogurt, also salt and sugar. Whisk the yogurt to blend well. Refrigerate for about half an hour. Serve and enjoy. The pure, sweet juice that pops out of ruby-red, gem like seedsacs combined with chilled yogurt, it’s a simple food with an extraordinary beauty. Plump pomegranates and tart cranberries are in season right now here in Seattle. I purchased few pounds last weekend with the idea of preparing jam/cooked relish. I thought it would be fun to try something new with these two tart and fruity ingredients. I’ve combined the cranberries with pomegranate juice and water. The sweetener was the jaggery. I let them simmer on medium heat to jam like thick consistency. It was an easy process. I made pecan pancakes for lunch. The carbos and the bright tasting jam, I really liked the whole combination. People who go for unique flavors and anti-oxidant fanatics alike will enjoy this jam/relish, I think. Take pomegranate juice, cranberries and jaggery in a wide pot. Add water. Bring to a boil. Then simmer, uncovered for about 15 to 20 minutes, till the cranberries pop and the whole thing thickens to jam like consistency. Let cool and store in a clean jar. Enjoy with pancakes, or as bread/ chapati spread. Last week I watched a documentary on pumpkins called “Lords of the Gourd,” on PBS. The effort that goes into the giant pumpkin production was really amazing to see. Pumpkins were bathed in milk for prize winning looks, fed on bathtub sized fertilizer solutions, and grown to a groan-inducing size of 800, 1,200, 1,500 pounds - it’s pumpkin passion, godzilla style. The documentary covered many aspects of this competition craziness, but they forgot to mention how these giant pumpkins taste. It doesn’t matter I guess. If I ever participate in such competition, my pumpkin would be nourished on food blogs feed. :) Thousands of food blogs and all those mouthwatering recipes, the baby pumpkin would have no choice but turn in to a big balloon. Here is the rough sketch of how-to setup. The overfed champion would not only be big, but I am confident that it would also win in taste department. If not, I can always rely on my prized pumpkin recipe â€œMatar-Kadoo ki Dalâ€, the kind of dish that will thrill the taste buds and delight the eyes. Take green split peas in a vessel. Cover with water and simmer to tender (but not too soft). While the split peas are cooking, in another big pot, heat peanut oil. Add and pan-fry the wadis to crisp. Remove them to a plate and set aside. In the same pot, to the heated oil, add and toast cumin, mustard seeds and curry leaves. Next goes the onion and ggc paste. Cook until onions are soft. Add the cubed pumpkin, and saute for about five minutes. Sprinkle the crisp wadis and serve with rice or roti. It tasted great on its own also.